Diet plays an important role in improving your hair heath, including your hair texture, shine, and the rate of hair growth. 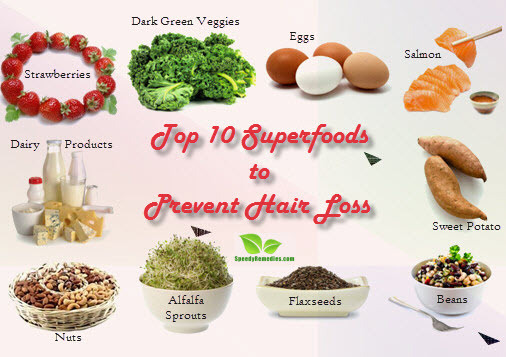 There are some superfoods, in particular, which, when taken on a regular basis, can promote healthy growth of hair and fight hair loss. In fact, poor diet and vitamin deficiencies tend to encourage loss of hair. For instance, vitamin deficiencies like that of vitamin A, B vitamins, iron, and zinc are often linked with hair loss. Flaxseeds are one of the best sources of omega fatty acids. Moreover, they contain protein, B vitamins, vitamin E, iron, zinc, and so on. So, when striving to increase your hair growth or prevent hair loss, make sure you include these healthy superfooods in your regular diet. Moreover, be cautious of other factors such as smoking, stress, lack of sleep, etc. linked with hair loss. In addition, do not torture your tresses with improper hair care measures, heat treatments, and unsuitable hair products, especially the ones containing harmful chemicals like sodium lauryl sulfate, sodium chloride, and so on that contribute in causing hair loss.